Canon Rumors, Nikon Rumors, Sony Rumors, and more Camera Rumors ! Nikon D800 / D800E is one of the most popular professional DSLRs released in 2012. Here are several recommended lenses for the Nikon D800. The 50mm portrait standard lenses are very popular. Of all the lenses, the new released Zeiss Otus 1.4/55 is the best, but it costs you $4,000, very expensive. Luckly, there is another new announced lens: Sigma 50mm f/1.4 DG HSM Art lens, which is known as one of the best 50mm lens. Other than this lens, three best lenses are from Nikon and Sigma – the Nikon AF Nikkor 50mm f/1.4D, Nikon AF-S Nikkor 50mm f/1.4G and Sigma 50mm f/1.4 EX DG HSM. At 85-135mm lenses, besides world best 85mm lens Zeiss Otus 1.4/85, the Nikon AF-S Nikkor 85mm f/1.8G, the Nikon AF-S Nikkor 85mm f/1.4G, Zeiss 135mm f/2 Sonnar T* lens are your best choices with the DxOMark score all at 40. If the Nikon 85mm f/1.4G doesn’t fit your budget, then take a long look at the Samyang 85mm f/1.4 Aspherical IF. It lacks any autofocus ability, but a score of 36 is remarkably good for such a low priced lens. If you can live with the manual limitations, it is worth serious consideration. If you are choosing a standard zoom lens, the new released Tamron 24-70mm lens is the best with highest score even better than AF-S NIKKOR 24-70mm. For a zoom lens to score 29 is pretty impressive, especially given the high resolution of the camera, where flaws caused by compromises in optical design are more obvious. The 70-200mm lenses are also very popular for Nikon D800. This focal range covers a lot of requirements and is used regularly by photographers in most genres. The best lens tested on Nikon D800 is the Tamron SP 70-200mm f/2.8 Di VC USD lens. And the well known AF-S 70-200mm f/2.8G ED VR II takes the second place. The latest released Nikon 70-200mm f/4G ED VR is also a great lens compared to the AF-S 70-200mm f/2.8G II, with a score of 28. This lens costs only $1399 – a good value for money option – as much as a lens costing over $1000 can be considered value for money. The 70-300mm lenses are often seen as “kit lenses”. They are effectively cheap lenses that offer a decent focal length, but generally the compromises made in achieving the large focal range mean image quality suffers. Of the four lenses, the Nikon AF-S VR Zoom-Nikkor 70-300mm f/4.5-5.6G IF-ED comes out as the top choice for two reasons – firstly, it has the highest sharpness score of the quartet, managing 12P-Mpix and secondly, because it features Nikon’s Vibration Reduction system. With such a long focal range, having VR is a real benefit in achieving sharp shots while handholding and so this lens makes the best choice. 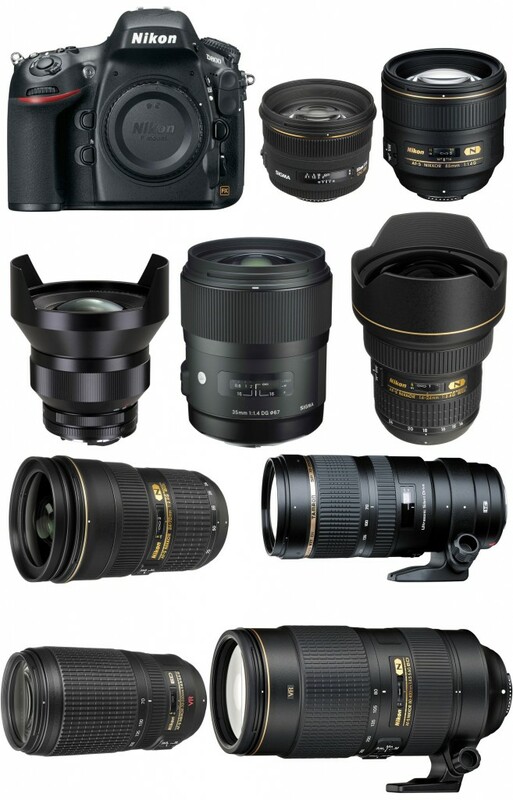 For the Telephoto Prime lenses, there are several great choice for Nikon D800, see the list below. The AF-S NIKKOR 200mm f/2G ED VR II is another DxOMark Best lens. Of the 7 lenses tested by DxOMark, the best lens is from Sigma, the new Sigma 120-300mm f/2.8 DG OS HSM lens. The AF-S NIKKOR 200-400mm f/4G ED VR II and new released Nikon AF-S NIKKOR 80-400mm f/4.5-5.6G ED VR are another great lenses. For a lower price, there are two that really stand out. The first is not a true super-zoom in the sense of being an all-in-one lens, but instead offers the longest focal length that will be of interest especially to those shooting sports or wildlife. It is the Sigma 120-400mm f/4.5-5.6 DG APO OS HSM. With a sharpness score of 12P-Mpix, it beats the other lenses and doesn’t really lose out greatly in any other area, hence why it top scores with a DxOMark Overall score of 25. The Carl Zeiss Distagon 15mm f/2.8 lens is the best ultra-wide angle lens, for the best image quality, offers the highest sharpness levels, with a P-Mpix score of 17. The one thing to remember with this lens though, is that it does not offer any AF as it is a manual lens. Provided you are willing to work within these limitations, it is the best choice in terms of optical performance, with a DxOMark Overall score of 27 and a sharpness score of 17P-Mpix. If you are looking for a lens that is not as expensive, then for value for money, the Sigma 20mm f/1.8 EX DG ASP makes a good choice at substantially less cost than the Zeiss 15mm. Within the wide-angle prime lenses, the Sigma 35mm F1.4 DG HSM A lens is the best. The second lens is the Carl Zeiss 35mm f/1.4 but as with the previous Carl Zeiss lens, this is a manual model with no AF. The Nikon AF-S NIKKOR 24mm f/1.4G ED is another good wide-angle prime lens except the price. From the list, it is clear that Nikon’s 14-24mm is the king of wide-angle zoom lens. The new released AF-S NIKKOR 18-35mm f/3.5-4.5G ED lens is just two points after 14-24mm. And both the Tokina AT-X 16-28mm f/2.8 PRO FX Nikon and Nikon AF-S Nikkor 16-35mm f/4G ED VR lenses are sharpness lenses. However, the faster maximum aperture of the Tokina and the lower distortion and chromatic aberration scores see it come out as the best choice scoring 24 to the Nikon’s 23. The fact that it is nearly $500 cheaper ($749 vs $1260) merely serves to make it an even better value for money option. In the Nikon’s favor though, there is a vibration reduction system included, though this is usually less useful in wide-angle shooting. Macro lenses are also very popular for Nikon D800. From the list, the best Macro lens for Nikon D800 is from Zeiss: The Zeiss Makro Planar T 100mm f/2. The Nikon 105mm f/.8G Macro lens is well known lens, also one of the best choice for Nikon D800. Support Cameraegg, Buy from one of our affiliate retailers, Thanks ! Nikon Df Price Between D800 and D610 ? Tamron 35-150mm f/2.8-4 Di VC OSD Lens Announced, Price $799 ! How to support us ? If you're getting any photo gear, books or anything, simply using any of links below when you order anything, is the biggest help to us to keep adding to this free website.